Unfortunately, my birds don't eat guava, persimmons or raspberries. I never actually tried to feed them guava or persimmons but I've tried with raspberries and, for some reason, most of my birds don't eat them. Mine won't eat anything red. I don't think it's the color red that prevents them from eating the raspberries because they do eat other red stuff - of the top of my head: strawberries, cherries, pomegranate seeds, red peppers, blood oranges, ruby grapefruit, radishes and red Swiss Chard but I am sure there are others... I just tried Cara Cara oranges a few days ago and they ate them without a problem, too. Chance doesn't like a lot of red fruit, either. She won't eat strawberries, or raspberries. She will eat apples but I've read that it's healthier for the bird to peel the apple, I think it's high in iron or something which isn't very good for the bird's liver. Chance loves cherries, though, but with cherries, they need to be pitted. 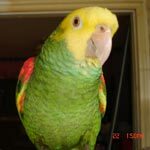 Can we make a list of fruits to give to our parrots, and how they should be prepared? I know citrus fruit should be limited. Mine won't eat any thing red. When I give them a whole apple they will peal it then eat it. Well, for one thing, I don't believe that citrus need to be limited. I have seen this as well as the 'citrus is not good for parrots because it's too acidic' myth but I have no idea who started it or why. My birds eat all types of apples [but I get more Gala than other kinds because I love them myself], oranges [regular, blood and Cara Cara], tangerines, ruby grapefruit, pommelos, bananas [never ripe], strawberries [not often because they need to be organic and they are too expensive], blueberries, blackberries, pears, grapes [different kinds, including champagne when they are on sale], watermelon, fresh and naturally dried and reconstituted pineapple, cantaloupe, honeydew, coconut, pomegranate seeds, cherries, mangoes [mostly the regular ones but, sometimes, the yellow ones], papayas, kiwis, peaches, nectarines, plums, and there is also the dry raisins, currants, cranberries. dates and figs that I get dry and sometimes reconstitute before adding them to the gloop or just add dry to the birdy bread. I think I got them all. Of course, there are also all the fruits that we call 'veggies' like tomatoes, cucumbers, peppers, etc. My gray [and the ones I had before, too] seem to like very juicy things like watermelon, cantaloupe, grapes, a ripe peaches or pears, etc. but it's not as if she would not eat any other kind because, this morning, for example, they got bananas and grape tomatoes and she ate them both - of course, the tomatoes do fall in the 'very juicy' category but not the banana and that was the first thing she picked up. About the same time that Myrtle was able to fly I had a fruit bowl on the counter. You got it. There was a perfectly pealed orange siting in the bowl. They like to peel their own oranges and apples. When they aren't too expensive I will just cut them in half and turn the cut side down so they can peel them. They seem to eat more when they can peel them. I don't know if they actually eat more of the fruit but it does keep them entertained for a long time. Right now, I have two half-peeled pomegranates hiding in my cupboards because Javi Caique cannot resist a whole fruit - if he sees one, he HAS to peel it!